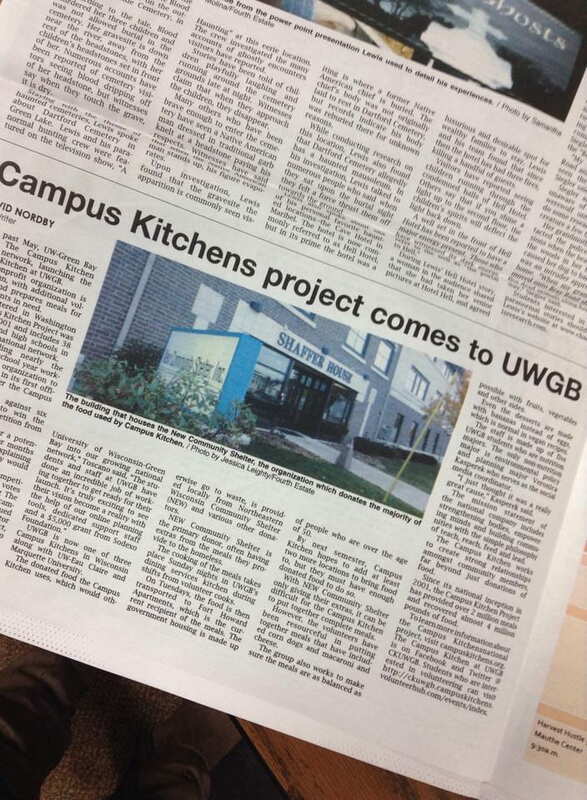 Welcome to the new Campus Kitchen UWGB 2018-2019 Website! Volunteering with Campus Kitchen at UWGB is an awesome way to serve your community, build leadership skills and your resume, make friends, and fulfill any volunteer hours needed for classes, grad school applications, etc. We’re pumped to start cooking and serving starting THIS WEEK! Learn more about what we have in store for 2018-2019 by checking out this new presentation: All About CKUWGB! If you would like to get to know a little more about CKUWGB before volunteering, or have a question that needs answering, please check out our Facebook, Twitter, and Instagram, or send us an e-mail at socampuskitchen@uwgb.edu! For those who missed our semester opener, here are the meeting minutes and power point for your viewing pleasure. Please send us an e-mail if you have questions about any of the items discussed. Meeting Minutes 3-31 & 4-21! For those who have not been able to attend our Tuesday meetings, here our past two minutes. Officer positions will be finalized in the coming weeks as we work to fill in some of our open seats before the semester ends. Congratulations to all who were elected at our meeting! As 2014 winds to a close at the University of Wisconsin-Green Bay, the leadership team at CKUWGB would like to give a warm shout out to everyone who has supported us this year! Thank you! To celebrate a year of constant success, here is a recap of all we have accomplished this past semester since we couldn’t have done it without you! No Waste Breakfast 2014 Leadership team! 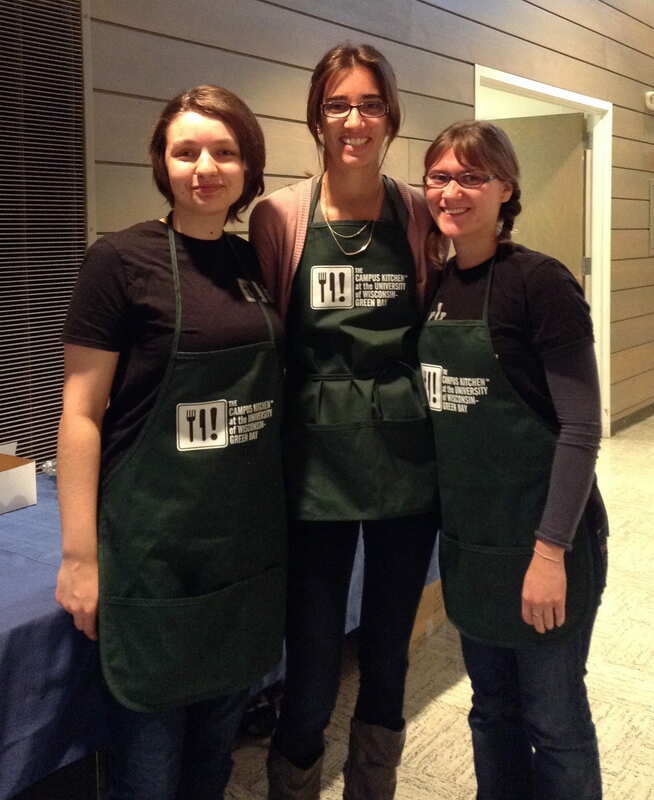 On October 24th, 2014, we participated in UWGB’s Food Day celebration by hosting our third annual No Waste Breakfast to kick off the day of food related activities! Decked out with bags of recovered food waste and re-usable plates and silverware, we fed both students and community members a free breakfast. In total, we recovered 60lbs of breakfast goods including bagels, cookies, and bread. All left over food was then donated to Paul’s Pantry. We even made it on to Good Day Wisconsin! We look forward to hosting this again come Fall 2015. 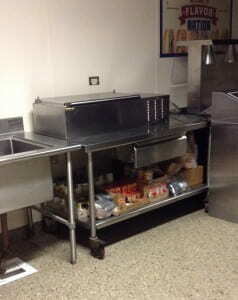 In November, we took the first step towards possibly having our own storage and cooking space! 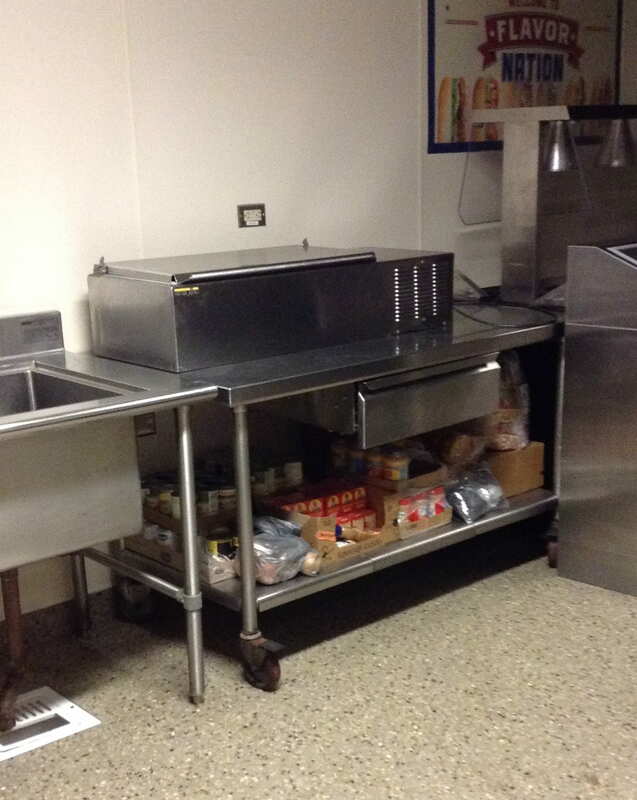 While we can’t say for sure what’s going to happen down the road, having our own little room has really helped us stand out as an organization on campus and allows us to expand our food recovery efforts. In November, the Campus Kitchen at UWGB got a shout out in the school newspaper, the Fourth Estate! Thank you again to the editors who decided to promote our story and help get the word out about we do in the community. Throughout the semester, Campus Kitchen at UWGB volunteers cooked and served meals for the residents at Fort Howard Apartments. Cooking on Sundays and serving up on Tuesdays, we fed 15 to 25 hungry patrons bi-weekly. Thanks to this success, Fort Howard Apartments can be considered our first long standing partner on the road to reducing food waste. In November, One of our continuous sponsors New Community Shelter allowed us to come in on a Friday afternoon and cook up a delicious meal for their patrons! Our cooking/serving shift was a huge success with a large volunteer turn out and more off-campus cooking is planned for Spring 2015. We even made it on to Fox 11 just in time for some Thanksgiving coverage. 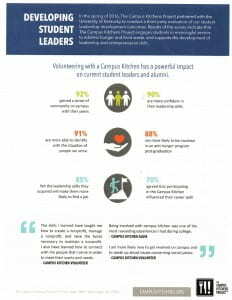 Throughout the semester from September to December, we logged 223 volunteer hours composed of community and student volunteers. These volunteers worked through 587 pounds of recovered food that was then turned into 279 meals! We are very proud of our leadership team and the student volunteers who continuously came out and showed their support for our cause. Thank you! Thank you once again to all of our amazing volunteers and supporters. While we are done now for December, we will be resuming again come late January just in time for Spring semester. If you are interested in volunteering, please make sure to check out our page, or send us a message at our new e-mail, socampuskitchen@uwgb.edu!